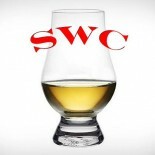 You see folks, the world of Single Malt is a rather small one. The market’s insatiable appetite for blends devours roughly 90% of all whisky production for the numerous brands. The 10% remaining is bottled as the noble Single Malt. We don’t take a certain side one way or the other when it comes to Malt vs. Blend, for we have had plenty of illumination when trying either style. But we are destined to be underwhelmed on occasion. 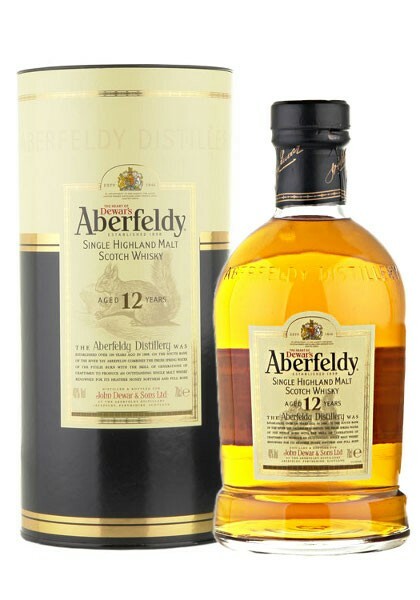 Today we turn our piercing and penetrating gaze upon Aberfeldy 12 Year Old Single Malt. John Dewar’s and Sons owns the Aberfeldy brand, it being the main component malt (among 40 in total) for Dewar’s White Label Blended Scotch Whisky. The new make spirit is aged for 12 years in ex-bourbon casks (no sherry here). A sip from the glass reveals a rather delicate and light whisky that is lightly peated to keep it interesting. We have seen quite a few single malts bottled outside of their respective blended destinations with great success, but it isn’t always so. Just because you see the “Single Malt” on the label, doesn’t always mean you have a home run. Take that, you malty malt-mates. Nose- Floral, heathery notes with nicely pronounced honey aromas. Cloves, sight juniper and light smoke. Delicate. Taste- Sugary sweet and viscous. Honey and spice with some burn. Finish– Short, fast and drying with slight smoke. Perfumed flower. Comment– Unremarkable overall but some nice qualities peek out on occasion. But, put it back on the shelf, perhaps.